Striker leaves Rugby Park for Mansfield Town. Ben Hutchinson has left Kilmarnock to sign for Blue Square Premier side Mansfield Town. The 24-year-old striker signed a six-month deal with Kenny Shiels’ side in the summer after impressing during a trial period. 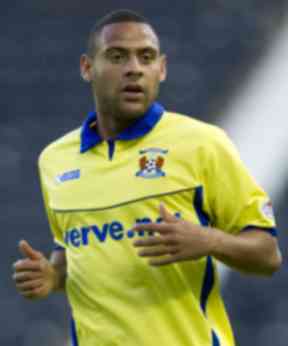 However he found first-team opportunities limited at Rugby Park due to injury and the form of Paul Heffernan. The former Celtic, Swindon and Lincoln attacker started in Killie’s first SPL match of the season against Dundee United. In total he made five appearances for the Ayrshire side, scoring his only goal in the 5-0 League Cup win over Queen of the South in September. Mansfield are currently ninth in the Blue Square Premier Division with 38 points from 25 games. In addition to Hutchinson the club have also signed Oxford forward Matt Green and Port Vale midfielder Gary Roberts. Meanwhile Killie boss Shiels says negotiations are continuing with Doncaster Rovers to extend his son Dean’s loan spell at Rugby Park.